Latest release of Android version 9.0 has reach the top manufacturers aim of creativity, having experience how cool is v9.0 updates, Samsung decide to take out their own product even smother overwhelm Android Oreo. In 2017 just after flagship Samsung Galaxy S8 and S8+ were first in market to receive the update. Its so amazing to hear that the software has hit a Galaxy S7 edge. 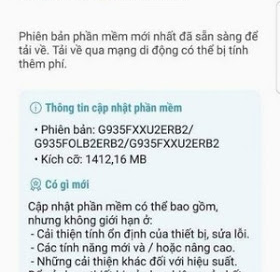 From the screenshot above screenshot though its purely written in Vietnamese language, expecting of weighs 1.4GB together with very heavy changelog. More of this news feed was uploaded as mp4 video on YouTube were it shown clearly the way Samsung moves with the experienced v9.0 and determination. Having watched the 2mins clip of 2mins we can tell that Samsung adds to previous features newly modify features to S7, for instance; the Bixby Home, lighting effect (new edge) tools like clock widget, calendaring showing date, month of event added , the newly updated vision of Bixby home screen has count and differentiate among other modified system on S7, it believe that more great features coming up in later time will be posted out. The 2:44 minutes clip proofs this is the beta version of Galaxy S7 Oreo so far updated. Since the Korean company haven't report others official changes made regarding this beta program.